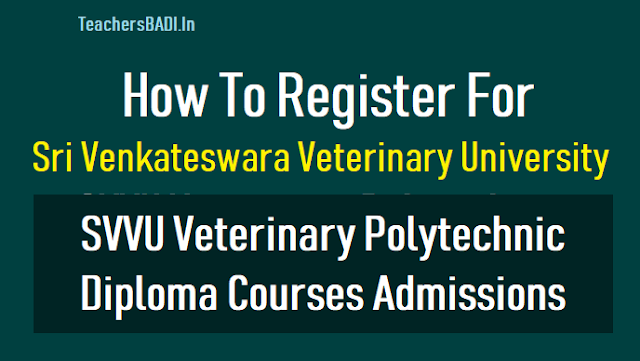 Sri Venkateswara Veterinary University Online Admission for Diploma Courses: SVVU Veterinary Polytechnic Diploma Courses Online application form submission instructions. How to apply Online for SVVUV Veterinary Polytechnic Diploma Courses admissions, How to make payment of online Application Fees, How to fill the SVVU Online application Form. Sri Venkateswra Veterinary University, Tirupati has given the online admission notification for B.V.Sc.,&A.H, B.Tech (Dairy Technology) & B.F.Sc. Courses in Animal Husbandry /Fishery / Dairy Processing Polytechnics. Online applications are invited from the eligible and interested candidates for admission into above said courses. There are 10 Animal Husbandry Polytechnics (7 government + 3 private affiliated) and 2 Fisheries Polytechnics (1 government + 1 private affiliated) and 1 private affiliated Dairy Process Polytechnic. Two year Diploma in Animal Husbandry is offered at the AH Polytechnics and two year Diploma in Fisheries is offered at the Fisheries Polytechnic. The diploma courses cater to the need of develop suitable man power for Para Veterinary, Para Fisheries and Dairy staff in the AH Dept., private dairies, poultry farms, hatcheries, self employment , Fisheries Department, private and public aqua farms. The 10th class or S.S.C passed rural youth are eligible for admission and the medium of instruction is Telugu. 1.Diploma in Animal Husbandry. 2.Diploma in Fishery. 3. Diploma in Dairy Process..
1. For best view, the applicant should use Internet Explorer / chrome / Firefox while filling the application. Do not use the Back button on the toolbar of the browser. Use the links and buttons available on the page to move from one page to another. Further, when the application process is completed, close all the open browser windows so that others cannot copy your personal details. 2. The applicants should note that the admissions will be made as per the relevant government orders applicable at the time of admissions. 3. The applicant should carefully read the information brochure before proceeding to apply online. You can either download a copy of the information Brochure (or) click here to download or read it online. 4. Please note you will have to register using a valid mobile number and verify it using the 6 digit verification code that you will receive on your mobile number. 5. You will not be able to edit the inputs of the application once it is SUBMITTED. In case of any technical queries kindly contact_09789841598. 6. Check the information and documents uploaded carefully before proceeding to the next step. 7. The applicant should read and understand all the instructions and eligibility criteria for admission before proceeding to fill the online application form. 8. The applicant is advised to take a print out of these instructions so that you can refer to the same while filling the form. 9. The applicants should furnish all the details while filling the Online application Form. After successful submission of the data, an application number will be generated and this can be used to complete the remaining steps of the application form and can also be used for future correspondence. 10. The scanned passport size(3.5 cm x 4.5 cm) photograph of the applicant should be uploaded at appropriate place. 11. The applicants signature should be scanned and uploaded. 12. Documents to be scanned and uploaded. The candidates are advised to keep all the documents ready before filling the application. · SSC or equivalent examination certificate, showing the evidence of the Date of Birth. · In case, an applicant belongs to Backward classes, scheduled Castes and Scheduled Tribes, the latest certified copy of the social status certificate issued by the competent authority. · Bonafide / Study Certificate from 6th to 10th or its equivalent. · Form - I - Caste Certificate - certified by MRO. · Form - II - Nativity Certificate – Certified by MRO. · Form - III – Non - Municipal Area study certificate – Form - III has to be certified by Head master with official seal and MRO certification with his office seal that the applicant has studied for minimum period of four years in schools located in Non-Municipal areas during the period of study from 1st class to 10th class. · Submission of false/fake documents will lead to summary rejection of the application. 13. Payment of application fee. For applicants belonging to OC and BC social status, the fee is Rs.600/- and for applicants belonging to SC/ST & PH Categories, the fee is Rs.300/- The applicant has to select Debit Card / Credit Card (Visa / Master Card) / NET banking option to pay the application fee and follow the online instruction to complete the payment of fee. 14. You NEED NOT send the hard copy of the filled application form to the University, Please take a Printout and bring it along during verification. 1. Number of vacant seats in Government Animal Husbandry Polytechnic and Fisheries Polytechnics, Private [affiliated to SVVU, Tirupati] Animal Husbandry, Fishery and Dairy Processing Polytechnics are given in a separate table. 2. Open competition (OC) means all eligible candidates belonging to all categories including BC,SC,ST, Special Categories (CAP, NCC, PH and sports) including open Category. West Godavari, Krishna, Guntur and Prakasam Districts. SVU Region :- Nellore, Chittoor, Kadapa, Ananthapuram, Kurnool Districts. Unreserved (UR):- All eligible Candidates irrespective of any region. 4. The seats in various polytechnics shall be filled in as per the presidential order and rule of reservation based on the X class grade. The matrix of seats available in various Polytechnics will be displayed in the website. 5. The duration of the Polytechnics is for 2 years and the medium of instruction is Telugu. The pattern of Education in Polytechnics is semester system. 6. The selection of candidate under SC, ST, BC and Special categories (CAP,NCC, PH and sports) quota is subject to clearance by the respective social status directorates of Government of Andhra Pradesh, Army, NCC, Medical doctors, Physical Education Departments respectively. 7. The submission of application by the eligible candidates is completely online. 8. After the completion of online submission of applications by the candidates there will be scrutiny of applications. The list of the eligible candidates will be displayed in the website along with not eligible candidates and conditional eligible candidates. 9. After one week the merit list of candidates will be announced and displayed in the website. 10. The candidates have to give their order of preference for thirteen Polytechnics while filling the online application. 11. After exercising of options is completed the list of the candidates with allotted polytechnics will be displayed in the website and the candidates who are allotted seats are requested to go to the nearby following centres to get their certificates verified. All the candidates are requested to carry their originals for verification. Once the certification is completed the allotment letters are sent by email and speed post. LIST OF CENTRES FOR CERTIFICATE VERIFICATION AND SOCIAL STATUS. i] Animal Husbandry Polytechnic, Garividi , Vizayanagaram District. iii] College of Fisheries Science, Muthukur, Nellore District. iV] College of Veterinary Science, Tirupati, Chittoor District. V] College of Veterinary Science, Proddatur, Kadapa District. 12. The candidates are advised to join within stipulated date. The vacant seats in the first round of online counselling will be filled through second round of counselling. 13. The candidates belonging to special categories (CAP, Military, NCC, PH and Sports quota) will be called to attend counselling at SVVU, Tirupati for filling the special category seats. What should be done before submission of online application? Step 1: Log on to university website www.svvu.edu.in. Step 2: Click the link for prospectus Read the prospectus carefully and understand the eligibility conditions for candidature, reservation, weightage (if any) etc., you can save or print prospects and detailed admission programme for your ready information. Step 3: List out the documents/certificates required for your candidature for admission to the said degree course. Step 3: Scan the required documents carefully with clear visibility of the contents. Avoid scanning of documents using mobile camera. Remember it is your responsibility to scan the desired documents correctly. Step 4: In case both sides of a document needs to be submitted make single pdf file of both sides. The same can be done in case more than one certificate is to be uploaded at one place. Step 5: Save the scanned document by giving suitable file name such as SSC mark sheet etc., which helps you to upload correct document at right place. Step 3: There will be two links as ‘New User’ & ‘Registered User’. Step 3: For registration click on “New User” button. Step 4: Select the quota applicable for your candidature. Step 5: Fill all the mandatory fields like name, Caste category, date of birth, mobile number, e.mail, gender etc., in the desired field of Online form. Step 6: All the notifications from University are sent to registered mobile number and e.mail, so please enter details very carefully. Step 7: The details filled in registration form cannot be modified or edited once payment is done. How to make payment of online Application Fees? Step 1: Only online payments are accepted. Step 2: After saving the registration form, you will be redirected to Payment Gateway. Step 3: You can use your Debit Card or Credit Card or Internet Banking to make the payment by selecting appropriate options. Step 3: After payment is successfully done, the candidate will receive message regarding user name and password on his registered mobile number & e.mail. Step 3: In case payment transaction is successfully done, the user name and password will be normally received within few minutes or may be delayed to maximum upto few hrs. Step 4: Once payment is made. It shall not be refunded in any case. How to fill up the Online Application form? Step 1: The Registered candidate can then open “Registered User” with the help of User name and password received to him or her. Step 2: The application form is then available for filling up the required details and uploading of relevant scanned documents. Step 3: Fill all the details in the form and upload required documents (JPG or PDF format only). Step 4: By using ‘Back’ button on the application page you can go to previous page and make any modifications (Except the registration page) before final submission is made. Step 5: Refer check-list of documents to verify that all required documents have been uploaded. Step 6: You can complete filling of the application at once or at any time before the last date of submission of application form as a registered user. Step 7: After filling up all necessary information and uploading of the necessary documents, preview the filled in application form, uploaded documents for correctness and visibility of the contents. Step 8: Only after satisfaction of correctness of the application form the candidate should click the ‘submit’ link as no changes can be done after submission. Step 9: Candidates will receive SMS, email informing that your application has been successfully submitted. Step 10: After submission you may take printout of the submitted application and preserve for your record. Step 11: Do not forget to note down your application number and password. What are the precautions to be taken while uploading certificates or documents? 1. Good quality photographs/scanned copy of the documents should be uploaded. 2. Scan your documents / certificates properly and preview the uploaded documents to check whether it is readable or not? 3. Scanned certificate or document with more than 5 MB size be avoided or reduced to lower memory by making it PDF format. 4. Prefer using Google chrome or Internet Explorer 9 or any such upgraded browser for better results. 5. You can withdraw or upload the document till your final submission but once final submission is made no entries can be edited or no documents can be uploaded. How to check, preview and take printout of application form? 1. After final submission of the application, click on the “Print Application” button to take the print out of the application form. 2. Any time after submission of application form and before the last date for submission, the candidate can again view his/her application by using login as “Registered User”. 3. It will open submitted application form. 4. In case candidate observes that entries or uploaded document in the submitted application form are incorrect, in such case candidate has a option to submit fresh new application before the last date of submission. 5. In case the candidate has submitted more than once application form, the latest filled in application form completed in all respects will be considered for merit list. What to do in case forgot password? 1. Click on “Registered User” Login page will be displayed. 3. Enter the Application Number and Registered Mobile Number. 5. You will received your password via SMS on registered mobile number and email. How to find out whether my submitted application has ben submitted properly or not? 1. You will receive SMS and email after final submission of application confirming that your form is submitted. 2. Click on concerned degree and after that click on “Registered User”. 3. Login using the Use ID and Password. 4. If your application form is not displaying “Submit” or “Back” button, then you can confirm that your application is successfully submitted. 5. If you observe blinking message on the top of your application form as “You are requested to submit the application”. It means that application has not been finally submitted. In such case click the submit button. 1. After receipt of application form upto last date of submission, it will be primarily scrutinized and the list of candidates with deficient or incorrect documents will be notified on the website. Such candidates will have an opportunity to upload the deficient documents online before the date notified for this purpose. It shall be the responsibility of the candidate to fulfil this deficiency within given time. How to know about provisional merit list, final merit list or request for filling of options, admission allotment, reporting have been notified by the University? The Candidates should frequently visit the website for updates regarding admission as per the admission programme. The eligible candidate will also be receiving message through SMS/email at every step of admission process as per the schedule of admission programme. When candidate has to fill up the option form? Candidates should note that it is essential for desirous candidate to log in for submission of the option form /preference form during every round of admission in which he want to be considered for admission, otherwise he/she shall not be considered for admission during that round.